Skiing for beginners in the USA. Spend your first ski holiday in the States and you’re off to a spectacular start. Resorts really pull out the stops to make first ski weeks wonderful, from the palpable passion of the English-speaking ski schools to the state-of-the-art learning facilities and gloriously wide, gentle groomers. Choose accommodation near the lifts for speedy slope access OR stay in historic towns if you want to catch some culture – either way public transport systems make exploring the area a breeze. Only downside is… Once you’ve had a taste of America’s amazing ski resorts, they’re hard to beat. A sanctuary for wobbly skiers everywhere, Buttermilk lets you in on Colorado’s legendarily light snow and spectacular surrounds without the stress of a mountain that’s too wide or steep. Family crowds flock here to learn to turn, but never in numbers big enough to mean you’ll find lift lines. A terrain park that’s often voted the best in the US and annually hosts the X Games keeps it all from getting too sedate. 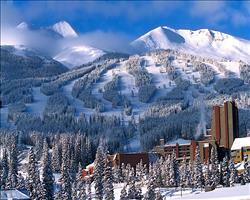 The definitive list of the top ten best beginner American ski resorts. All of these learner ski resorts have at some stage held titles like "best Beginner American ski resort" or "best beginner snowboard resort in the USA", or been included in the winners lists of top novice ski resorts such as "top Beginner American resorts", "top Beginner American snowboarding resorts"... In a nutshell, they're the USA's best places to learn to ski.